So I gathered up my decorating supplies and got to work. I went with Funfetti flavored cake because it’s a personal favorite. If you recall, last time I used the Bake Pop, I followed its recommendations of using milk instead of water and adding an extra egg. The result was an awesome looking cake bite but unfortunately, it tasted stale. This time, I just followed the directions on the cake mix box. The cake tasted a million times better but was a bit softer and more challenging to dip – but doable! In the future, I’m going to stick with the cake box directions. Once the cake was baked and cooled, I melted a small batch of the candy melts. I proceeded to dip the end up the sticks in the candy melts and then in the cake to help them hold together. Then I threw the whole batch in the fridge for a few minutes. The full box of cake mix made 36 Cake Pops. The first half I dipped in the pink candy melts and threw some themed sprinkles on them. The second half, I dipped in the red candy melts. Something to note - the Bake Pop only comes with 18 sticks to use. The sticks they provide have the stopper at the end to help the cake stay in place. My second batch, I had to use plain old lollipop sticks and they were more difficult to work with. The cake kept slipping off. I will say that I like the way the red candy melts covered the cake better then the pink ones. Overall, the red ones looked better. Also, it might not look like it in the picture below, but when I put the sugar crystals on the red cake pops, it looks like I covered them in glitter! 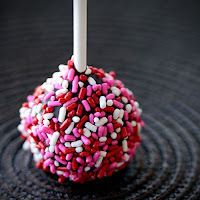 So there you have it - my Valentine’s Day Cake Pops- easy and super cute! Please note, how low the candy is in that apothecary jar and I’ve already filled it twice since putting it out! Sadly, I don't have a cake pop stand, so I had to just make due with what I had. I have seen some pins with DIY instructions on how to a stand. Perhaps you may be seeing a post about that in the near future. What do you guys think? 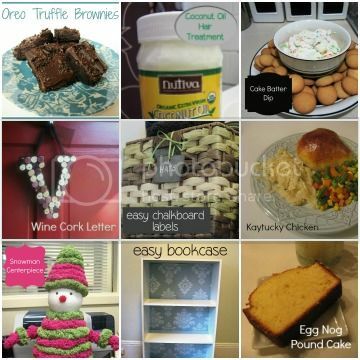 Have you tried your hand at any Valentine’s Day treats or décor recently? Share in the comments! Soo adorable. Great job. My cake pops never look that good. Thank you! I just checked out your blog. LOVE the Valentine's Day mailboxes! Those are so cute! Anytime I try cake pops, it's a major fail! Thank you! The Bake Pop pan definitely helps! I'll be checking your site to see how they turn out! Very cute - I must make cake pops! I haven't come up with anything yet as far as decorating for Valentine's Day! Now, I feel like a slacker!!! I love these cake pops, and aren't you absolutely THRILLED that they came out with a cake ball pan so we don't have to actually smoosh cake balls anymore? They are so much lighter this way! Anyway... these are lovely and I'm so glad I found you on the Transformation Thursday linky!! I am a new follower! I'm looking forward to coming back over and over and developing a sisterly blogger bond with you! You have been bookmarked as well! I know the pan makes it so much easier. I've attempted the tradtional cake pops before and it was a huge failure. Thanks for following! I just checked out your site and your granddaughter is adorable! They look great! Ive been wanting to try these! Stopping by from transformation thursday. Thank you! I'm glad you stopped by because I just checked out your blog and LOVE it! I even pinned a few things to remember for later. Aw, but they aren't as moist as the ones you make yourself. 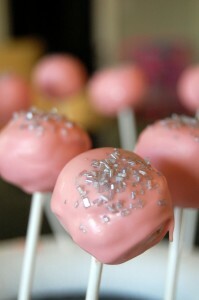 I just did a cake pop tutorial on my blog, I think you should try it before you swear off making them forever. :) They are SOO good! They came with the Bake Pop. I think you can order more from their website but be careful- sometimes when order things off those websites, they call alot trying to sell you other stuff. where can you get the cake pops sticks with stoppers. Alyssa- they came with the bake pop.